Ferengi Grand Nagus Zek (Wallace Shawn) comes to the station. He’s the aging leader of the Ferengi Alliance, and he names our buddy Quark as his replacement — to the shock of some gathered Ferengi who are much higher in the pecking order, including Zek’s son, Krax (Lou Wagner). 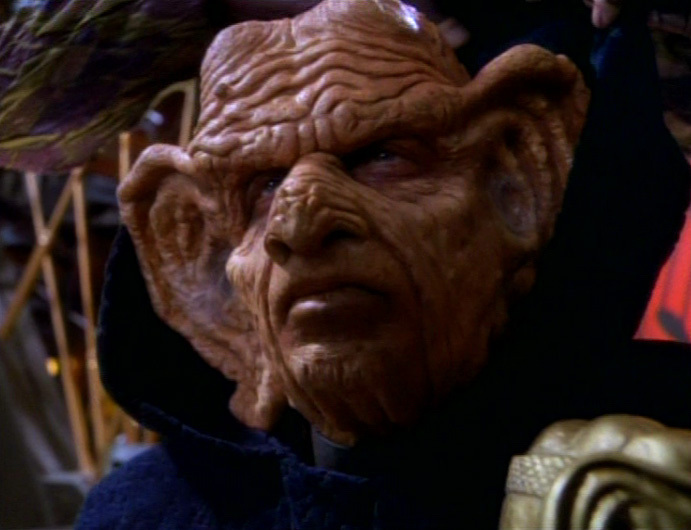 Quark, initially thrilled at his stunning accession, spends the rest of the episode dodging attempts on his life, including one involving his doofy brother Rom (Max Grodénchik) that Odo stops. But it was all a ploy by Zek, who’s still alive, to test Krax to see if he’s ready to take over. Convinced he’s not, Zek resumes his post, and Quark congratulates Rom on his cunning. Or something. 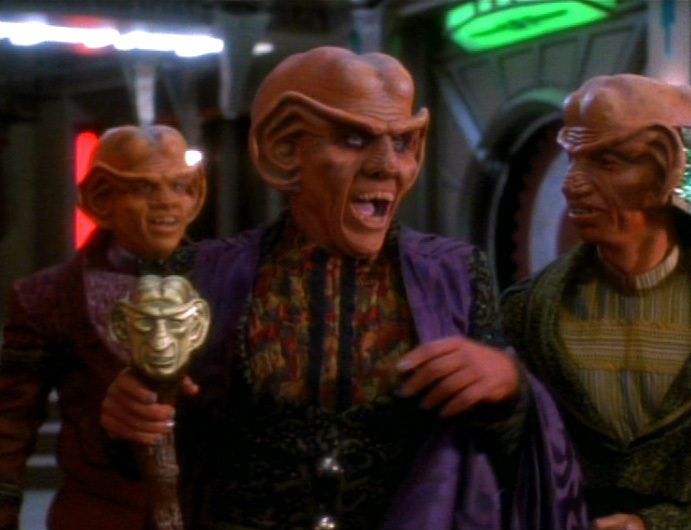 The Ferengi are a major Alpha Quadrant race. They, of course, were the aborted main villains on TNG, so DS9 took them and used them (mostly) as comic fodder for an episode or two for the next seven seasons. This episode is the first glimpse we get into the Ferengi’s government structure — essentially, a bunch of conniving businessmen plotting in a room — and Zek’s character shows up a lot over the next seven years. Quark’s odd standing as a bartender/shadowy character near the wormhole is sort of established here, too — as is his odd relationship with Odo. What can I say? I largely hate the Ferengi. 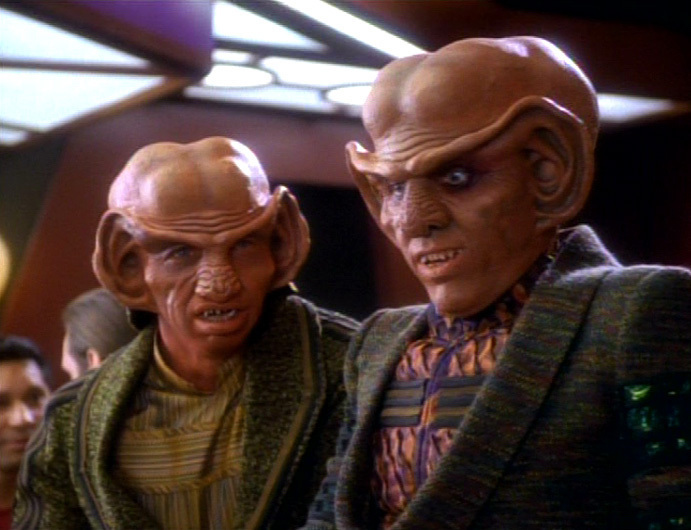 While some characters (Quark and later, his nephew, Nog) become more than cliches over the years, most Ferengi are just annoying. Zek and Rom have moments where they’re acceptable in future episodes, but the obvious and weak plays for laughs just make me wonder how much stronger DS9 would have been if the 10-14 episodes devoted to Ferengi goofiness had focused on something else (like, almost anything else). In other words, if a Ferengi episode were anyone’s introduction to DS9, I can totally understand why they didn’t stick with the show. That said, “The Nagus” is not an awful episode — particularly compared with most Ferengi fare — but it’s just not very good. Shawn actually makes Zek as acceptable as possible and the twist in here is somewhat unpredictable. So, I guess if you were to watch a Ferengi episode, this is one that wouldn’t make your eyes bleed like, say, “Ferengi Love Songs” or “Profit and Lace”. Nog, who’s essentially illiterate in DS9’s first two seasons, learns enough in less than a year to make him a viable candidate for Starfleet Academy by the third season! Either the acceptance criteria really fell after Wesley Crusher’s failed attempts in early TNG or Ferengi can process information at an incredibly fast rate — which would explain how Nog got so learned so fast. It also MIGHT explain how a bunch of apparent doofs somehow built a large space empire. They’re socially awkward and act like morons, but they can absorb information quickly. Oh, and one last thought: What the hell happened to Krax after this episode? We see a lot of Zek over the years and we see him eventually name his successor. Hint: It’s not Krax. All that said, the Ferengi characters can be used effectively in non-Ferengi episodes. Quark and Rom were both actually pretty well used in “Sacrifice of Angels” — arguably DS9’s most important episode — and Nog becomes an interesting character in the later seasons. I don’t hate episodes that include Ferengi. I just hated the vast majority of Ferengi-centric episodes. I guess we have “The Nagus” to thank for paving the way for all of them. And that’s unfortunate. Last point, while the Ferengi had already been somewhat downgraded since they initially appeared as TNG’s main bad guys, this episode, I think, really made them into second-rate powers who are mostly used for “comedy”. It’s worth noting that there’s little talk of Ferengi warships or the Ferengi Alliance as a military organization after about the second season of TNG. In fact, there’s barely a hint of Ferengi involvement during the Dominion War in DS9’s final seasons — though every other Alpha Quadrant power’s involvement or lack thereof is addressed. We see Bajoran political angst and we meet a couple major players going forward. THERE’s our favorite Cardassian monstrosity! Commander Benjamin Sisko (Avery Brooks) takes over as head of the new Deep Space 9, a former Cardassian space station. It orbits Bajor, which had been brutally occupied by the Cardassians for decades. The station is on the edge of friendly space and the Bajorans need the Federation’s protection and help to rebuild. Sisko’s mission is to ready Bajor for Federations membership, and he is identified by Bajoran spiritual leader Kai Opaka (Camille Saviola) as the “Emissary” an important figure in the Bajoran faith destined to discover the “celestial temple” where the Bajorans believe their prophets (gods) live. Working with his science officer, Jadzia Dax (Terry Ferrell), Sisko finds a wormhole (leading 75,000 light years away, to the Gamma Quadrant) near Bajor, and non-linear aliens inside it, possibly the Bajorans’ temple and prophets. A Cardassian vessel follows and disappears, prompting more Cardassians to come to the station, demanding to know what happened to the ship. Sisko eventually convinces the wormhole aliens that he’s not an invader and they help him get past his wife’s death — which occurred during the Battle of Wolf 359 — by showing he’s been living a non-linear existence (i.e. he’s stuck in the past). Sisko convinces the aliens to allow passage through the wormhole and returns the Cardassian ship to the Alpha Quadrant, preventing an all-out attack on the station. 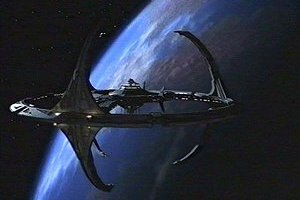 With the wormhole’s discovery, DS9 is set to become a key outpost for the Federation. The celestial temple — otherwise known as the reason the Federation got in a big war with the Dominion. 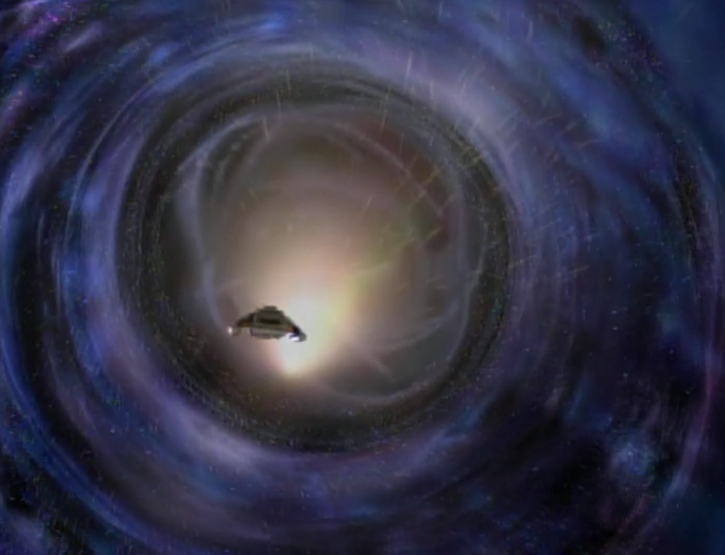 — The wormhole to the Gamma Quadrant, which sets the stage for the war with the Dominion in DS9’s later seasons. — The proximity to the Cardassian Empire, and notably Gul Dukat (Marc Alaimo) who would become DS9’s main villain. — The Bajoran theology and Sisko’s place in it, which would be a major thread throughout the next seven years. Bajor’s political instability would be a major thread in the early seasons. — The mysterious background of Odo (Rene Auberjonois), which would eventually tie in to the Dominion leaders, the Founders. All of that happened in DS9’s pilot episode — one that ALSO tied in TNG’s most significant event, “The Best of Both Worlds”. 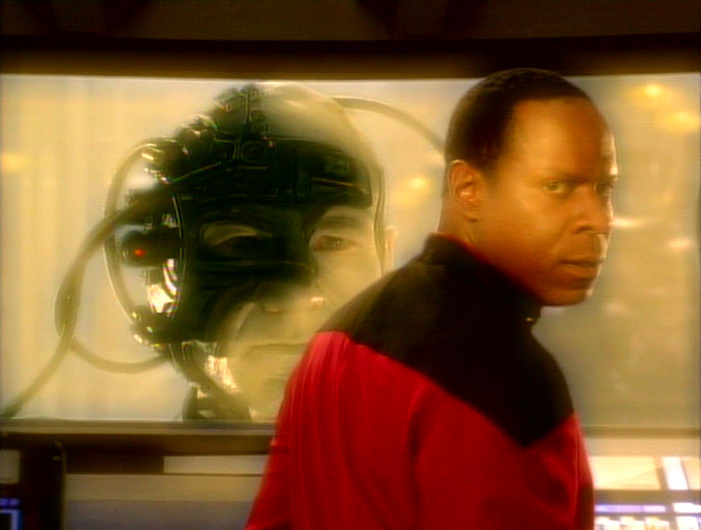 Having Sisko be a survivor of that attack — and having him harbor feelings of anger against Picard, who shows up in this episode — were truly great touches. DS9 wasn’t initially successful and was never as successful as TNG or TOS because it was so different. It was much darker — too dark, for some fans — and that was set into motion even in season one. But I’ve always felt DS9’s initial issues — other than some boring station-bound episodes — stemmed from many of the characters being over the top in the early seasons. Kira’s too angry, Odo’s too antagonistic, Sisko’s too brooding, Bashir’s too annoying and Quark is too villainous. The Dax character — who was pretty much totally redefined in season two — is too cerebral. Really, the only character who doesn’t become more likable over the years was O’Brien — and, of course, that was probably because the character had already existed for years on TNG. It’s almost as if the creators tried to do something SO different that they didn’t do characterization very well. That improved over time, but the characters are more like archetypes in the first season. As a result — and somewhat strangely — DS9 is the most interesting series to watch for its evolution. More than any other series, the first season is very, very different than the final season. From a consistency/historical perspective, DS9 sort of rewrote two alien races we first saw in TNG. Bajorans initially were a bunch of refugees and not slaves on their own planet. The Trill look changed here, but backstory changed more later as the relationship between the symbiont and the host was very different in TNG. For more, see our reviews of “The Host” and “Ensign Ro”. The first of many Ferengi episodes. Shoot me.